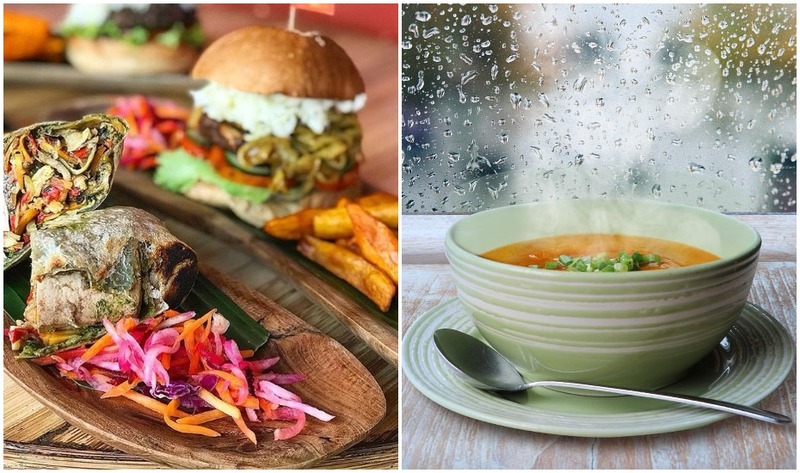 The best vegan restaurants in Bali: Where to find plant-based menus & vegetarian-friendly food you’ll LOVE! 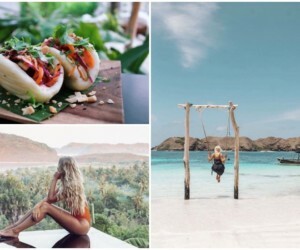 It seems like only yesterday that vegans in Bali were seen as extreme eaters – rare, mythical creatures that surely couldn’t survive at “regular” restaurants. But these days, veganism is the norm, and vegan restaurants in Bali are popping up faster than our almond milk flat whites are going down. We’re not just talking healthy salads and smoothie bowls here either. 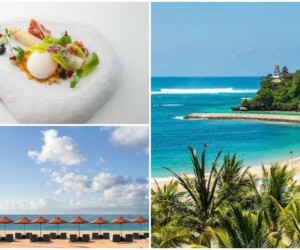 Across the island, you can find everything from vegan warungs and fast food restaurants, to vegan fine dining and everything in between. Pulled jackfruit? Check. Tempe burgers with cashew cheese? Double check. Creamy, hearty bowls packed with protein-rich veggies and legumes? Check, check, check. 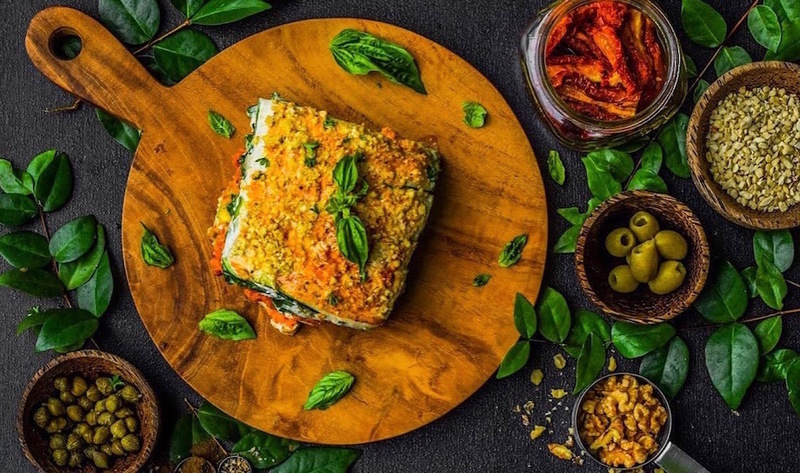 These delish and nutrish plant-based dishes are changing the way we eat, and even die-hard carnivores are taking the leap towards a greener, more sustainable lifestyle. 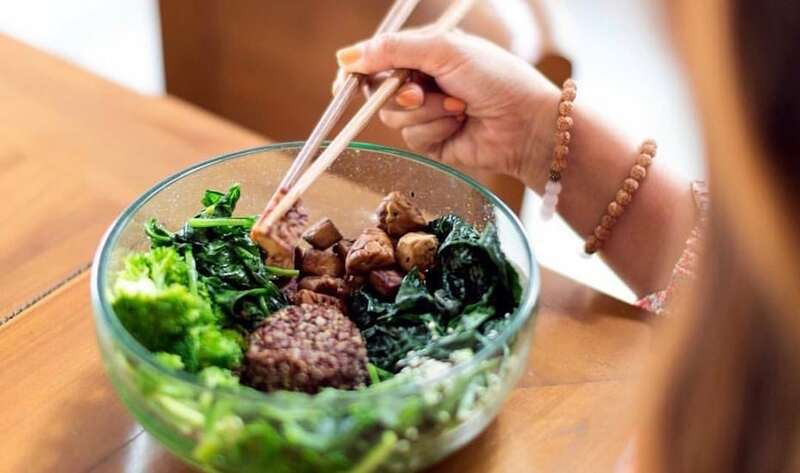 So without further adieu, here’s our list of Bali’s best vegan restaurants – from wholly vegan eateries to vegetarian restaurants with vegan-friendly options, here’s where you’ll find the best plant-based cuisine in Bali. Ahhh Peloton – one of our forever faves. 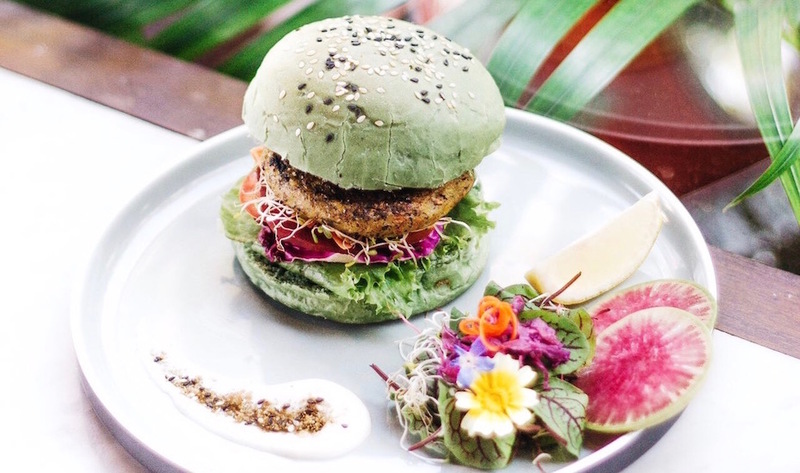 This wholly vegan café is an emporium of all things plant-and-pedal-powered – a Canggu icon that’s a huge hit with vegan crowds and non-vegans alike. That says a lot about the food repertoire here, which has been curated by a troupe of chefs and vegan foodies. Cool and breezy with industrial vibes, tuck into brekkie burritos, big salad bowls and the oh-so creamy cheesy lasagne. The imitation meats here are some of the best around, too. Peloton Supershop, Jl Raya Pantai Berawa, No. 46, Canggu, p. +62 813 3761 9335, e. info@pelotonsupershop.com. Open 7.30am – 10pm. 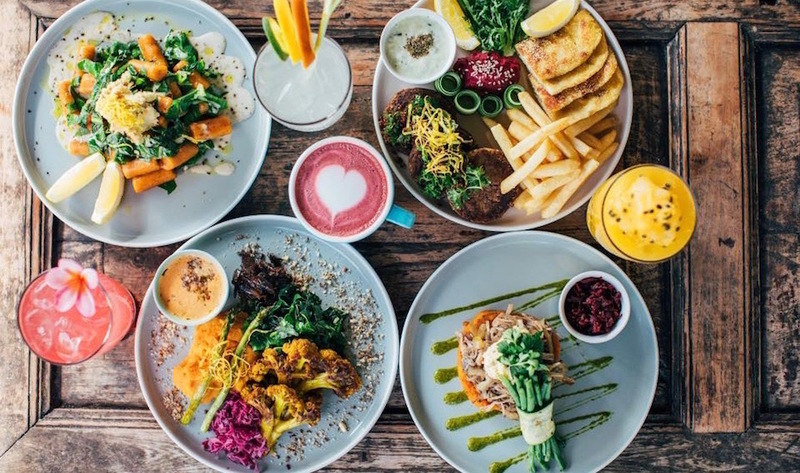 This boundary-pushing, plant-based Canggu cafe is a vegan game-changer, with cruelty-free cuisine that you’d never know is sans-meat or dairy unless someone told you. There are BLTs stuffed with vegan fried eggs and creamy vegannaise, pancakes stacked sky-high and chunky sandwiches that are impossibly cheesy – the kind that sticks to the roof of your mouth and melts into a delicious gooinesss. Meanwhile, the burgers are so big, so juicy and so gluttonous, you could almost call them beefy. 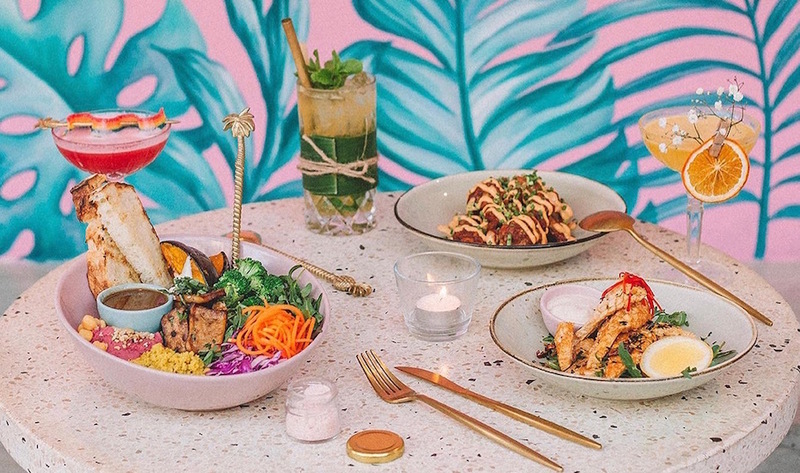 But don’t worry health-nuts, there’s also plenty of salads, wraps, colourful bowls and juices here too, wrapped up in the cafes tropi-chic interiors. I Am Vegan Babe, Jl Tanah Barak No. 49, Canggu. Open daily, 7am – 5pm. 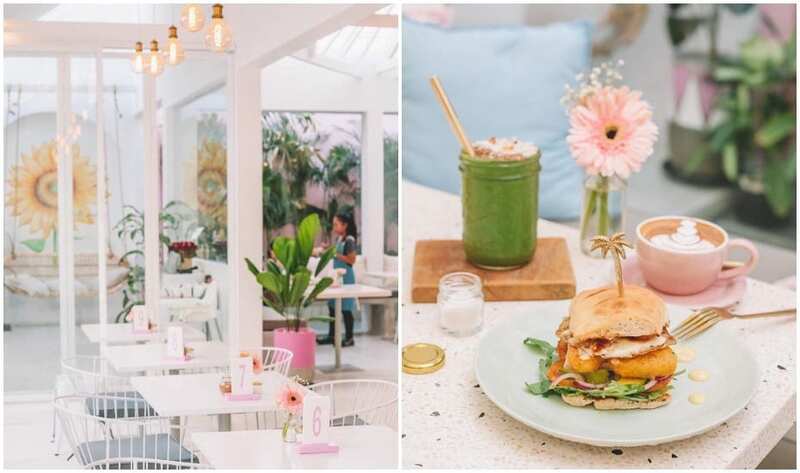 Tropical al fresco vibes, shabby-chic interiors and an entirely vegetarian menu with vegan options aplenty – The Shady Shack is one of Canggu’s most popular cafes, and for good reason. This super duper healthy spot dishes up delish signatures like the Japanese-inspired Nori Bowl, the juicy Shack Attack burger, sweet potato gnocchi (with almond feta!) and a rainbow of raw desserts, from brekkie and brunch through to lunch and dinner. Grab a cold coconut and lounge beneath the palms, or boost that immune system with a turmeric latte. So much yum. The Shady Shack, Jl Tanah Barak No.57, Canggu, p. +62 819 1639 5087. Open daily 7.30am – 10pm. 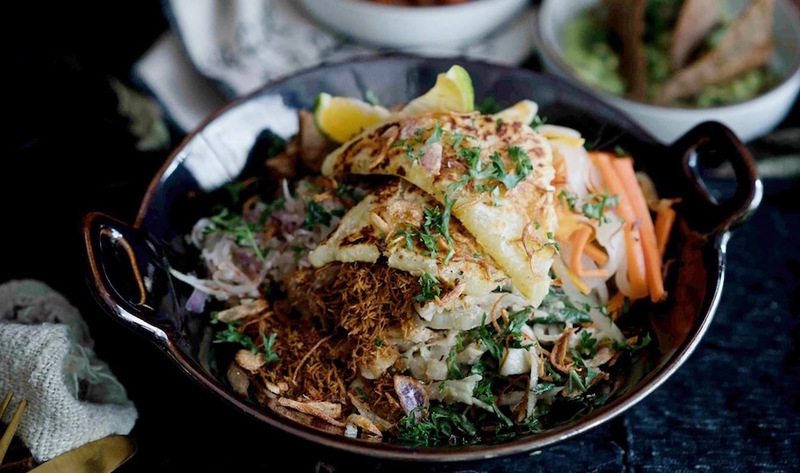 Just like your favourite warung (but with a plant-based twist!) GIVE Cafe dishes up wholly vegan Indonesian food alongside a Nasi Campur display of meat-less chicken, “pork” satay, heaps of veggies, cruelty-free sauces and sambals, and even Indonesia’s famous Beef Rendang given a mushroomy new look. But that’s not all. GIVE Café donates 100% of its profits to charity, meaning your Nasi Goreng Special (with a vegan fried egg) could help save a life or support a village. This kind and creative concept is of course from the same peeps who gave us the plant-based KYND Community cafe in Seminyak, and just like it’s bigger sister, it’s 100% vegan, and 1000% delicious. GIVE Cafe, Jl Padang Linjong No.85, Canggu, p. +62 818 0566 4720. Open daily 11am – 8pm. 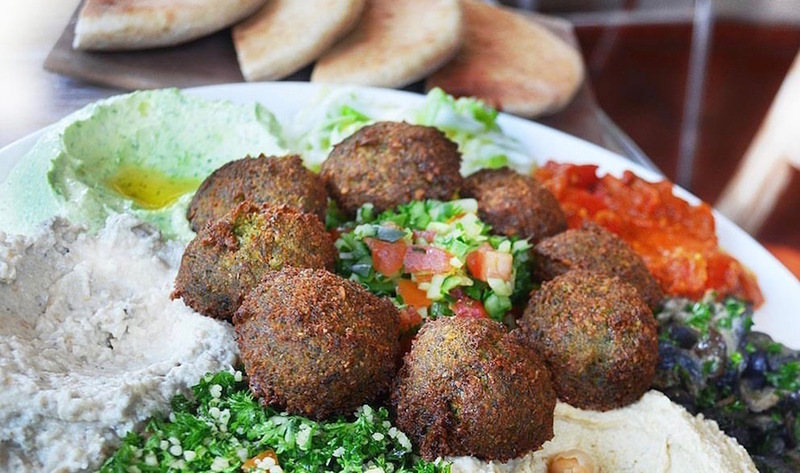 Answering all of your vegan pita prayers, Falafel Temple brings real, home-cooked, Middle Eastern cuisine to Canggu. 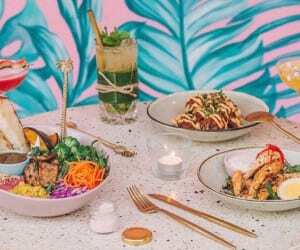 While there’s no green V’s or vegan signage here, the entire menu is wholly plant-based, inspired by the flavours of Morocco, Turkey, and Egypt. 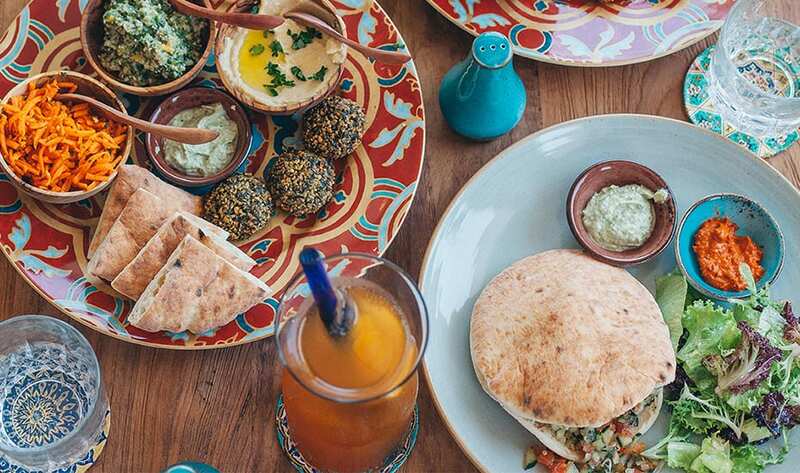 Think traditional spices, fresh local ingredients and some of the most deliciously enormous mezze plates we’ve ever seen (with the best falafel we’ve ever tried!). Falafel Temple, Jl Pantai Berawa No. 35, Canggu, p. +62 811 396 7979, e. info@falafeltemple.com. Open daily 10am – 10pm. 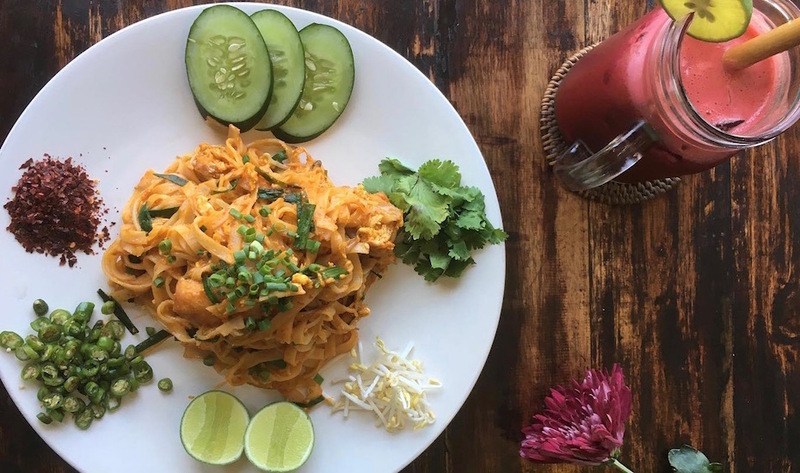 One of Canggu’s original vegetarian restaurants (with vegan variations available on almost everything), Green Ginger Noodle House is still going strong today, serving meat-free Thai cuisine done right. Veggie wontons, spicy laksas and slippery noodle soups are just some of the Asian sensations on the menu, served up in a traditionally small space that’s colourfully cluttered with pots, pans, trinkets and plant life; the perfect recipe for feeling right at home. And psst! 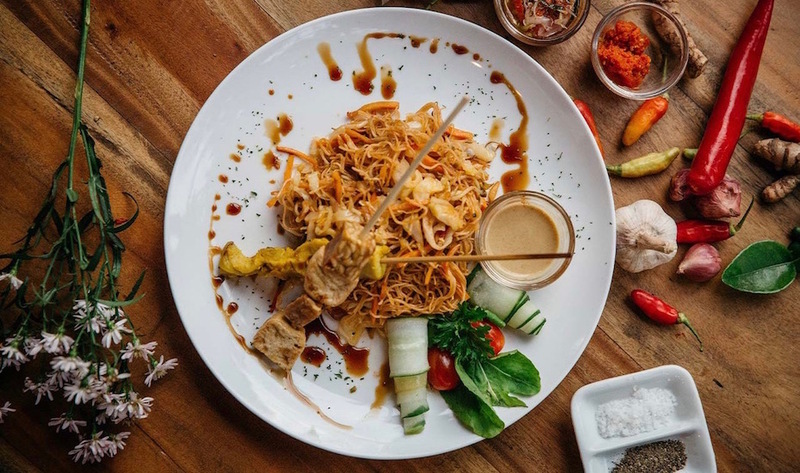 Green Ginger is the little sister to Ubud’s ever-famous vegetarian restaurants, The Elephant and Dumbo, so you know you’ll be getting the real deal here. Green Ginger Noodle House, Jl Raya Pantai Berawa, Canggu, p. +62 878 62112729. Open daily 8am – 10.30pm. 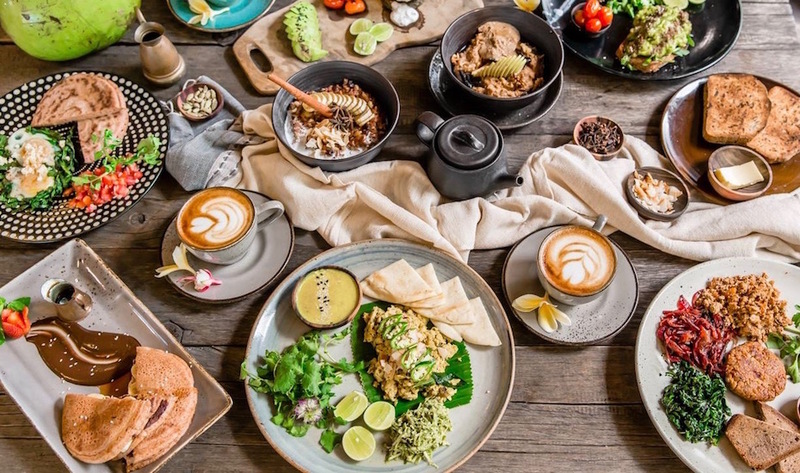 Not far from Echo Beach, Samadi Bali is a ‘Gourmetarian’ café that believes in the healing power of natural food, fusing vegetarian world-cuisine with Ayurvedic gourmet recipes, as well as raw, vegan dishes too. The Samadi kitchen lab uses seasonal organic ingredients produced by local farmers and partners, supporting fair-trade practices to help nourish more than just your tummy. Daily yoga classes, life coaching, acupuncture and a Sunday organic farmers markets all complement the Samadi experience. Samadi Bali, Jl Padang Linjong No.39, Echo Beach, Canggu, p. +62 812 38312505, e. info@samadibali.com. Open daily 7.30am – 3pm. Plant Cartel is living proof that vegans don’t just survive on lettuce. 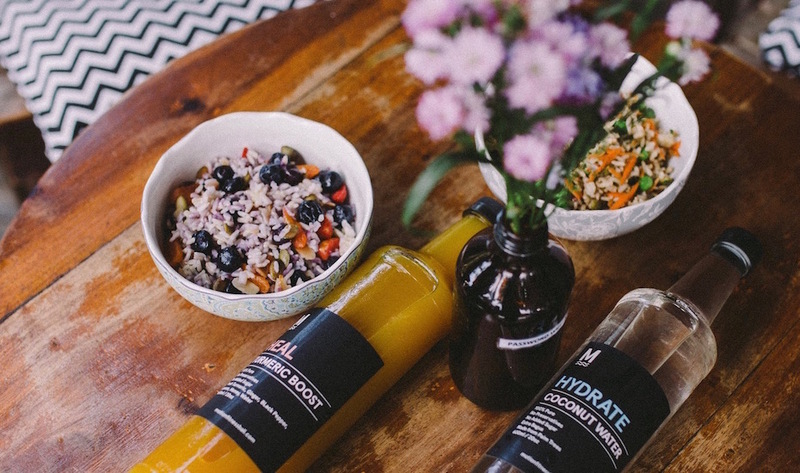 You won’t find any healthy soul bowls or macrobiotic raw food here at this Canggu trailblazer. Instead, you’ll be gorging on vegan fast food that’s just as “meaty”, just as naughty and just as satisfying as its carnivorous contenders. As such, the menu reads like a carby dream, from the Double Pleeseburger, The PcMuffin and Popcorn Chick’n, to the vegan hotdog, Mac & Pleese and loaded fries with a mountain of gooiness. Sorry Maccas, this is fast food of the future. This teeny tiny warung in Berawa was one of the first restaurants around to turn Indonesian food wholly vegan – and boy are we glad they did. Dishing up all of our fave Indonesian staples (we’re looking at you Nasi Kuning, Mie Goreng and Nasi Campur!) these local favourites come without any nasties (no meat, dairy, MSG or preservatives) and everything is 100% natural. Vinny’s Warung, Jl Pantai Berawa No.48, p. +62 878 618 349 07, e. vinnyswarung@gmail.com. Open daily 9am – 9pm. 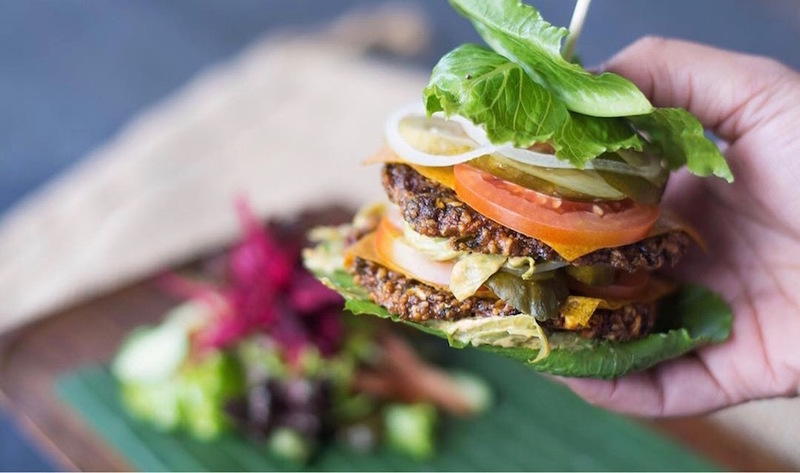 From the same people who gave us one of Bali’s best gyms, Motion Cafe (which was once Avocado Cafe) is a melting pot for Canggu’s vegetarian, vegan, gluten-free and raw food crowds – not to mention the fitness folk who fill up on the varied meal plans and protein-rich creations after pumping iron at Motion Fitness. Sip on a delicious juice or smoothie, see off a wheatgrass shot, or munch on the many vegan options here, like the black bean burger, the chickpea curry, and even vegan protein waffles. Motion Cafe, Jl Pantai Batu Bolong No.69b, Canggu Bali, p. +62 811 3999 411. Open daily 7am-8pm. 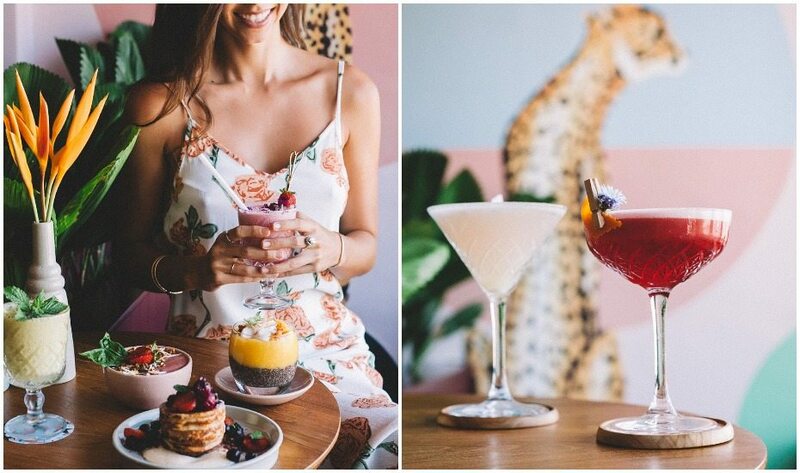 SO much more than just a café, KYND is a community of earth-conscious foodies serving up plant-based dishes and drinks for people who like to tread lightly – all in pinch-me-cute pink interiors with swings and Instagrammable lounges. Veggies and vegans will LOVE the menu, which is a feast of flavours that breaks the vegan mould. Think gourmet toasts with super wholesome toppings, Salt & Pepper Squid that you’ll swear is the real thing, and of course, some of the best smoothies and waffles in town. Their Korean Fried Chicken burger is our fave, closely followed by the Japanese Ramen. They even have a vegan ice cream parlour right next door! KYND Community, Jl Raya Petitenget No12x, p. +62 859 3112 0209, e. kyndcommunity@gmail.com. Open daily 6am – 11pm. 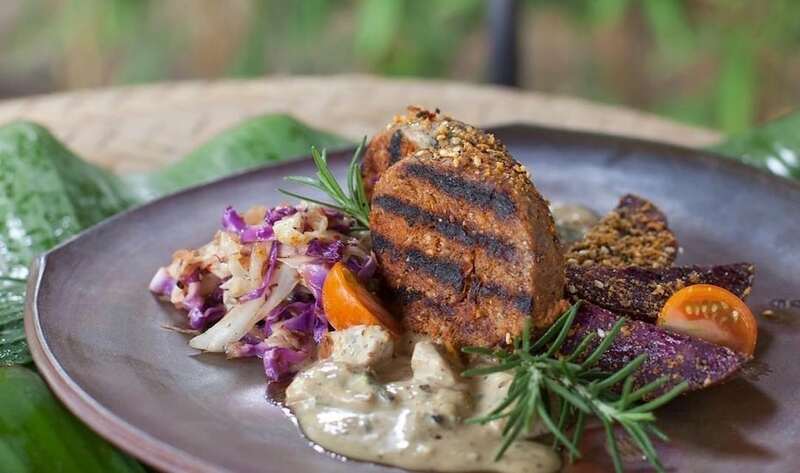 Divine Earth is one of Bali’s best artisanal vegan restaurants, home to mostly raw natural creations like zucchini rolls, lasagne, pizzas and plenty of desserts – all thanks to the owner, who’s a trained macrobiotic counsellor and nutritionist. Her progressive plant-based cuisine is not only vegan and cruelty-free, it also uses the most flavourful, nutrient-packed ingredients grown by environmentally-conscious farmers. To top it off, the upstairs is an intimate couch and cushion Cinema Club that shows an eclectic mix of artsy films alongside the scrummy menu. Divine Earth, Jl Raya Basangkasa No. 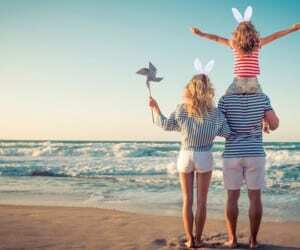 1200A, Seminyak, p. +62 361 731964, e. info@divineearthbali.com. Open 7am–11pm. 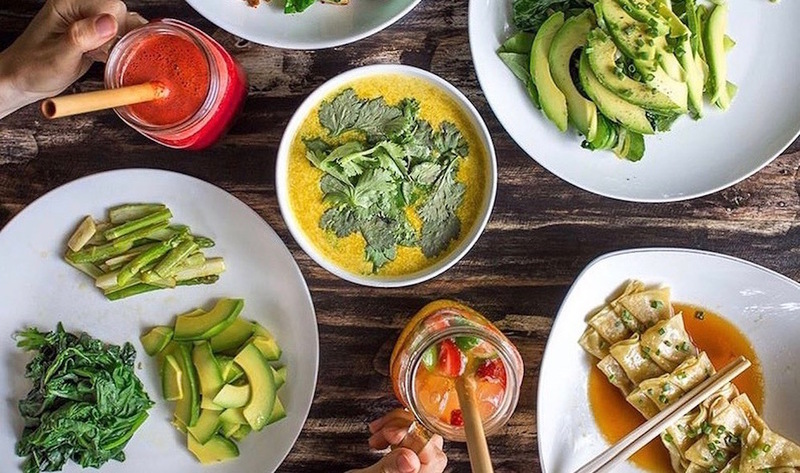 This vegan institution is not only home to plant-based deliciousness, but also a market store of organic produce, health-conscious groceries and earth-friendly cosmetics. Many a island vegan has been known to eat three, sometimes four meals a day in Earth Café – one of the original health food emporiums in town. Fresh and sourced locally, the ingredients here showcase the best of Bali’s organic, macrobiotic movement, with sensational flavours throughout. Earth Café, Jl Lasmana #99, Oberoi, Seminyak, p. +62 361 736645. Open daily 8am – 12pm. 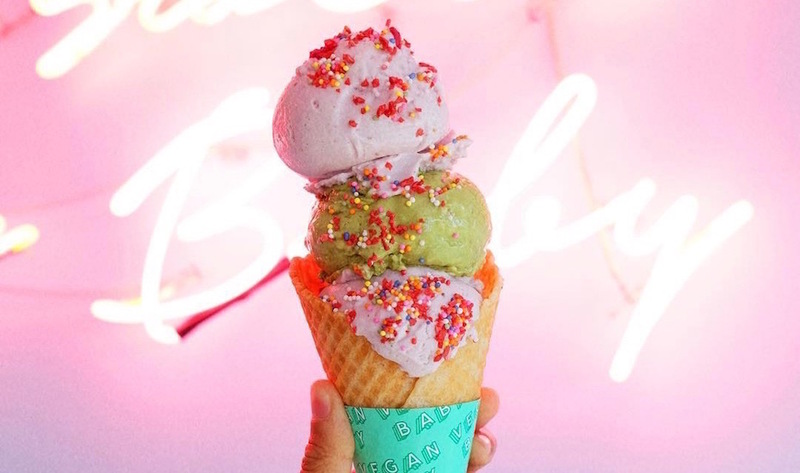 Vegan ice-cream on acid – Mad Pops is Bali’s wild and wacky dairy-free ice-cream parlour, complete with neon signs, risqué murals, 80s disco vibes and technicolour vegan sprinkles. From salted caramel ice cream, to peanut butter popsicles, Mad Pops makes allll the flavours that vegans have always dreamt of. You can also find the second Mad Pops parlour in Canggu, as well as countless cafes and restaurants stocking these naughty-but-nice sweet treats. Mad Pops, Jl Kayu Aya No.48, Oberoi Seminyak, p.+62 813 3777 9122e. hello@madpopsbali.com. Open daily, 11am – 10pm. 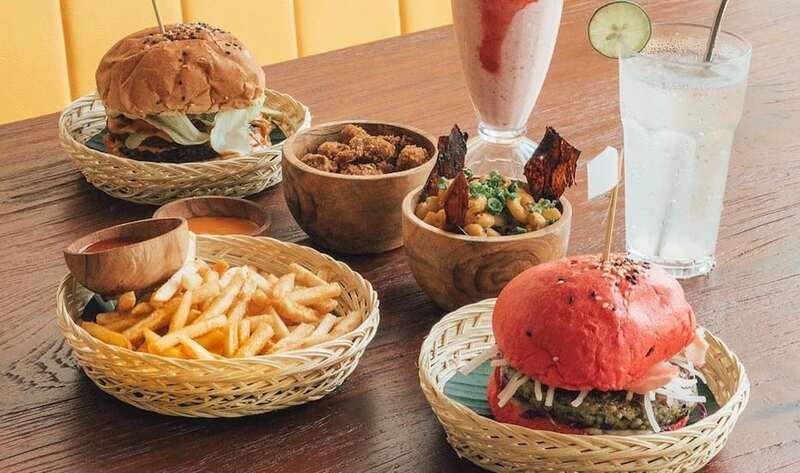 Though Neon Palms is not wholly vegan, this jungle cafe above everyone’s fave Seminyak boutique is proving that vegan is the future, with a menu revamp that added 20 different vegan items to its menu! Sitting above Bali Boat Shed and served up alongside wildlife murals and tropical interiors, graze on the vegan brekkie board (with chilli scrambled tofu, a chive hash-brown, avocado, asparagus, kale, pistachio dukkah and dragonfruit-cashew sour cream – to name just a few!) and vegan peking duck tacos for lunch, or vegan tapas plates for dinner. The colourful cocktails here are not mandatory, but highly recommended! Neon Palms, Jl Kayu Aya No.22 (above Bali Boat Shed) p. +62 813 5379 4644, e. info@neonpalms.com. Open daily 8am – 11pm. Described as a vegetarian paradise, Zula is one of Seminyak’s OG vegan restaurants, part of the same eco-empire as Earth Cafe. 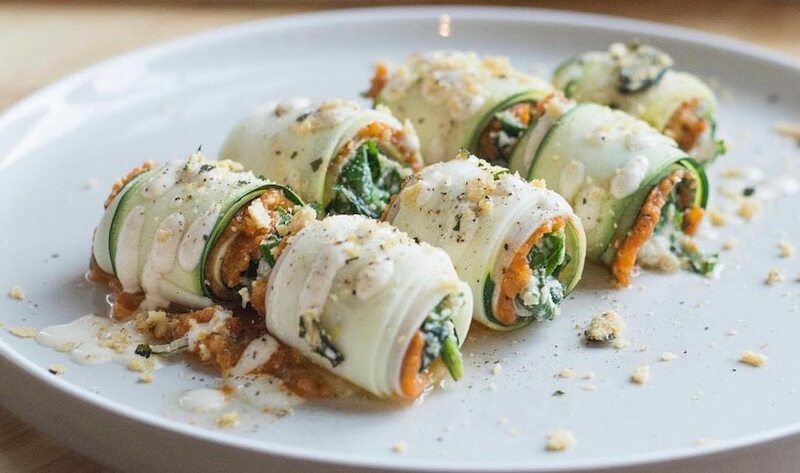 With cruelty-free creations like Seitan spaghetti meatballs, tempe maki sushi rolls, and Mediterranean share plates, it’s no surprise that Zula is still going strong today. Our fave is the macrobiotic Planet Platter, full of plant-based proteins and greens. Zula Bali, Jl Dyhana Pura No. 5, Seminyak, +62 361 732723, e. info@downtoearthbali.com. Open daily 7am – 11pm. 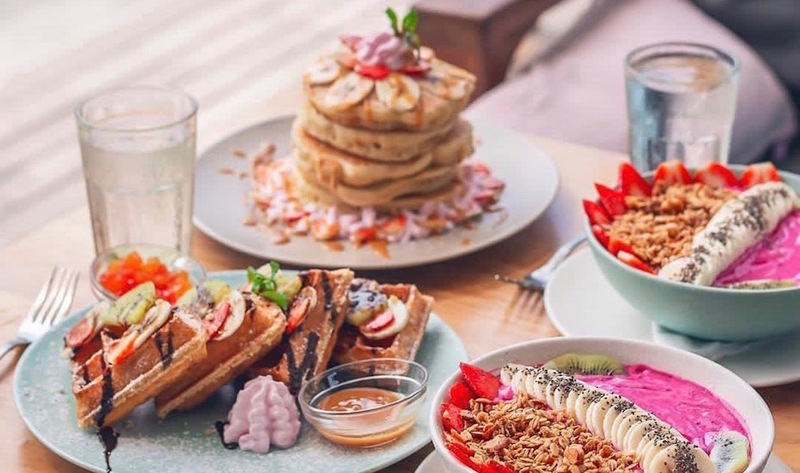 Powered by plants, Zest Ubud is one of our fave vegan brunch restaurants in Bali’s hippie heart. Expect meaty hunks of grilled jackfruit with caramelised corn and curry ‘mayo’, chunky kebabs stuffed full of fire-roasted eggplant, and hearty sides like smashed cassava fritters, taro root fries and sticky spiced carrots. And don’t even get us started on the desserts…. A Banana Muffin in a Glass? Oh yes. It’s all a little bit naughty, but oh-so very nice – in more ways than one! Zest Ubud, Jl Raya Penestanan Kelod No.8, Ubud, p. +62 823 4006 5048, e. hello@zestubud.com. Open daily 8am – 10pm. Vegan sorcery and raw chocolate wizardry at its finest – Alchemy is one of Ubud’s most famous vegan cafes where love, authenticity, health and gratitude are the core values. 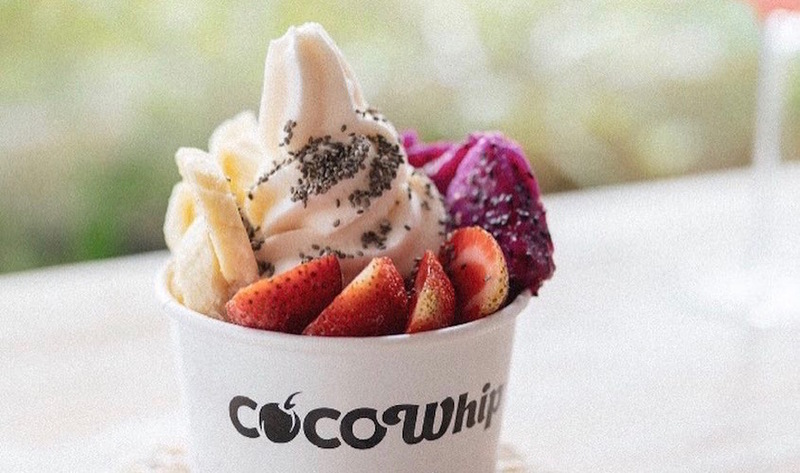 All-day smoothie bowls, raw pizzas, decadent banoffee pies and sugar-free Bounty bars – all of this served up alongside single origin coffee, juices and chilled kombucha. The build-your-own salad bowls are our fave here, with choose-your-own options like raw-mesan cheese, alllll the veggies and zesty dressings… it’s pure vegan magic. Alchemy, Jl Penestanan Kelod No.75, Sayan, Ubud, p. +62 361 971 981, e. marketing@alchemybali.com. Open daily 7am – 9pm. Moksa, Gang Damai, Sayan, Ubud, p. +62 813 3977 4787, e. info@moksaubud.com. Open daily 9am – 10pm. A wholesome raw food café with vegan vibrations a plenty, it doesn’t get much healthier than at Sayuri Healing Food. Everything here is wheat-free, animal & dairy-free, gluten-free & soy-free, Fancy learning how to knock out delicious raw food treats for yourself? Get down to one of the foodie classes and learn how these guys create the best raw vegan desserts we’ve ever eaten! Sayuri, Jl Sukma No. 2, Ubud, p. +62 361 908 0385, e. info@balirawchef.com. Open daily 7am – 10pm. 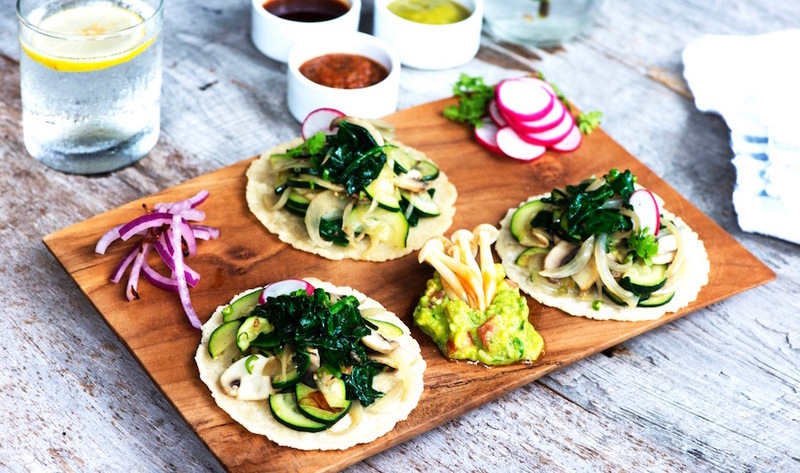 Bali’s first ever plant-based Mexican cocina, La Pacha Mama brings tasty tacos and bursting burritos to Ubud, all without the meaty fillings. 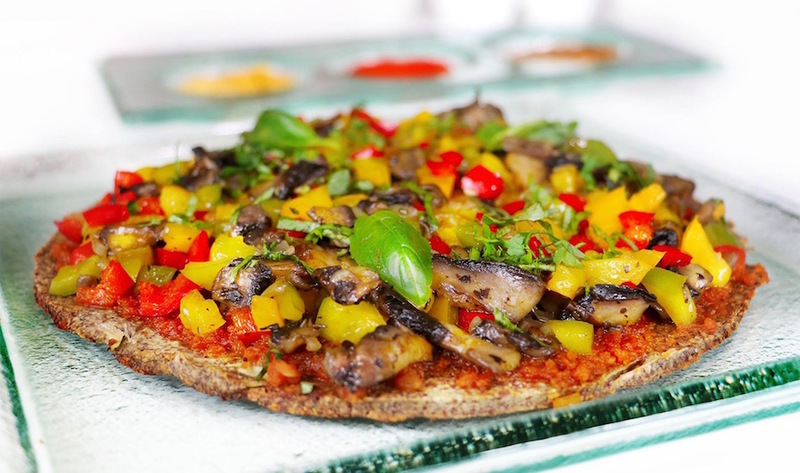 Using traditional meaty ingredients (replaced with plant-based alternatives) you can tuck into drunken mushrooms and carrot tostadas, grilled tofu tacos and slow-cooked jackfruit burritos, before a smattering of desserts and a very grown up drinks list add to the flavour of this Ubud staple. La Pacha Mama, Jl Raya Penestana Kelod 1, Ubud, p. +62 361 90 80 225, e. info@la-pacha-mama.com. Open daily 4pm – 11pm. 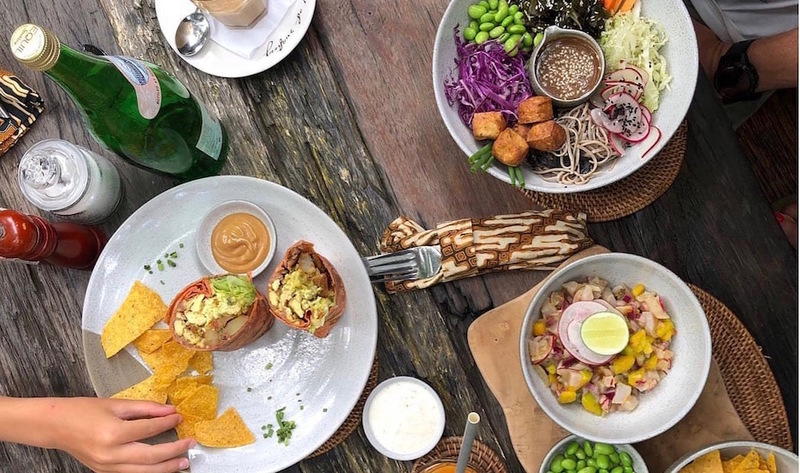 Summer salads, jackfruit tacos and bountiful bowls filled with healthful goodness – what more could you want from a vegan Ubud eatery? This beloved restaurant is all about big salads, creamy desserts, and a yummy selection of smoothies, juices, and mocktails. Try the Tempeh Buffalo Wings (they’re our long-time fave) and the sesame-crusted Teriyaki tempe – just make sure you save space for dessert, because their gluten-free Carrot Cake is legendary! Sage Bali, Jl Nyuh Bulan, Ubud, p. +62 361 976 528, e. contactsagebali@gmail.com. Open daily 8am – 9.30pm. Living Food Lab, Jl Raya Sibang Kaja, Banjar Saren, Abiansemal, Sibang Kaja, Abiansemal, p. +62 361 469875, e. info@livingfoodlab.com. Open daily 7.45am – 5pm. 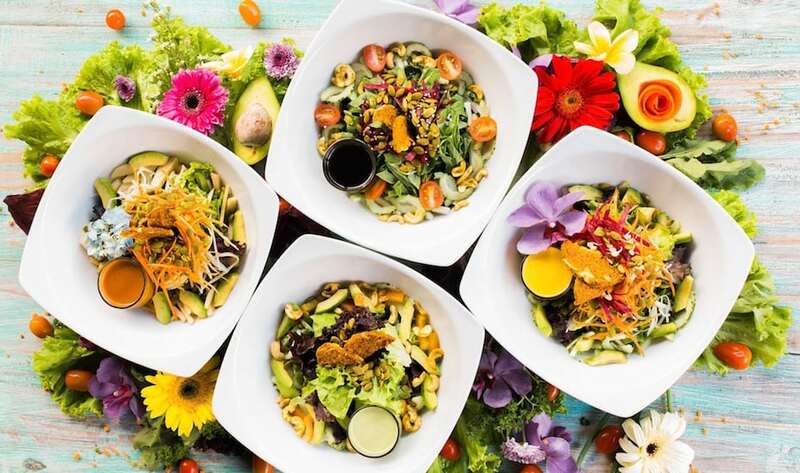 Combining fun, flavour, vibrancy and integrity through Raw Living Foods, Yoga and Holographic Kinetics – Seeds of Life is so much more than just a café. Drop by to sample their outstanding fare (raw, vegan and veggie, natch) and stick around to soak up their holistic approach to life. From Taoist tonics and Ashtanga Yoga to raw food classes and artisan Chinese teas, give your body and soul the once-over here. The Seeds of Life, Jl Gootama No.2, Ubud, p. +62 361 970 650. Open daily 8am – 10pm. 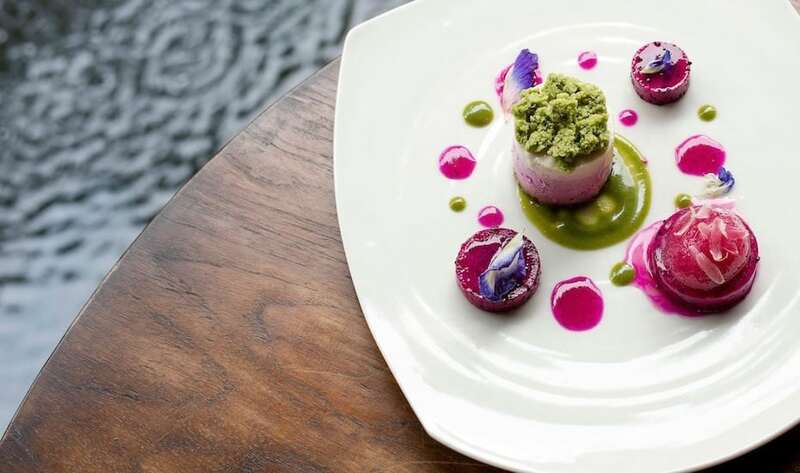 Set between the sacred Ayung River and lush tropical ponds and gardens, Sakti Dining Room is the award-winning vegan fine dining restaurant at Fivelements, dishing up Michelin-worthy vegan cuisine in an eco-luxurious setting. The menu is all about plant-based, raw vegan living foods, masterfully curated into some of the most stunning dishes we’ve ever seen. Different tastes, textures, vibrant colours and pure flavours are prepared with passion and utmost precision, letting mother nature’s gifts truly shine, To get a taste of the full culinary repertoire here, opt for the chef’s signature degustation menus at this impressive bamboo pavilion. Sakti Dining Room at Fivelements, Puri Ahimsa Banjar Baturning, Mambal, Ubud, p.+62 361 469 206, e. contact@fivelements.org. Open daily 7am – 11pm. 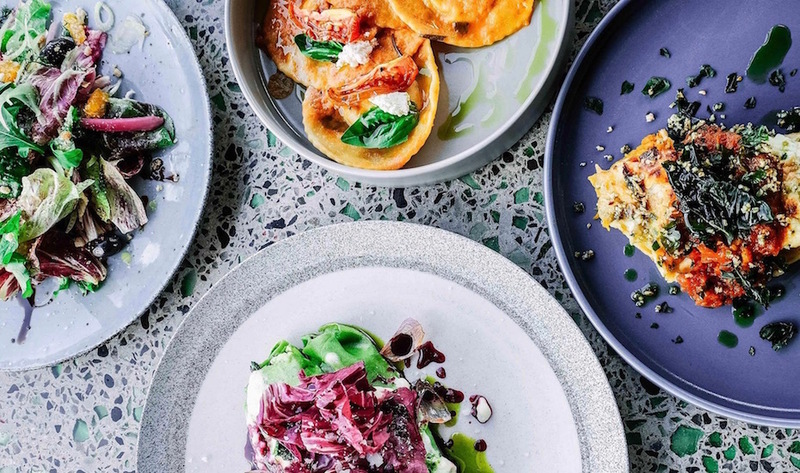 A modern wood-fired Italian food concept from the same conscious empire as The Elephant in Ubud and Green Ginger Noodle House in Canggu, Dumbo is all about good, honest food that’s as earth friendly as possible – without compromising on flavour of course. Try the roasted cauliflower, the antipasto plate and the creamy polenta with braised beetroot cheeks. The pizza here is also top notch (fresh outta the wood-fired oven) and if that wasn’t enough, 1% of all profits are donated to the protection of Orangutans in Indonesia, so you’ve a good excuse to stuff yourself silly. Dumbo, Jl Raya Sanggingan, Ubud, p. +62 812 3838 9993, e. bookings@dumbobali.com. Open daily 12pm – 3pm & 5pm – 10pm. The Elephant, Jl Raya Sanggingan, Ubud, p. +62 85 100 161 907, e. the.elephant.office@gmail.com. Open daily 8am – 9.30pm. 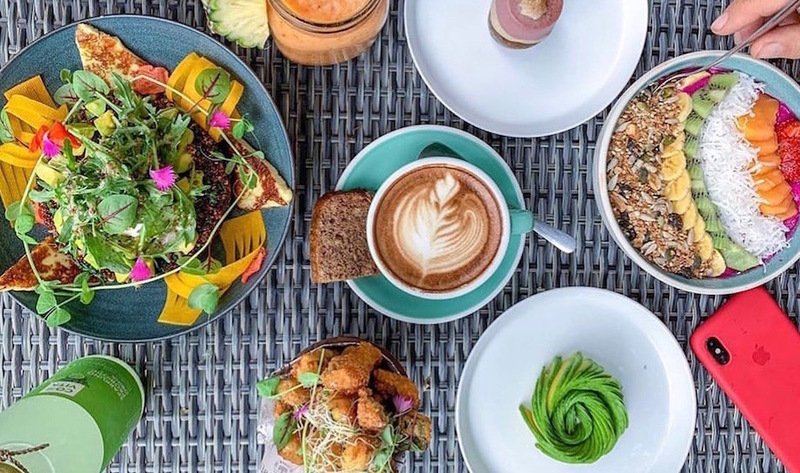 A one-stop-shop for healthy, holistic nourishment, Clear Café offers a ‘clean food for clear minds’ philosophy matched with homey furnishings and a refreshing list of tonics and elixirs. Dive into the super-delish international menu of organic, raw, vegan, and vegetarian staples (plus some seafood) like the Rainbow Salad (jackfruit, mango, red peppers, basil and mint with almond butter dressing) and the most virtuous veggie burger in history, complete with healthy fries and onion rings – delish and good for you, double win! Clear Café, Jl Hanoman No.8, Ubud, p. +62 878 6219 7585. Open daily 8am – 11pm. Head out to the back of this vintage surf mecca, and you’ll stumble upon Drifter’s peaceful garden café, where excellent coffee and a range of deliciously healthy dishes are served up all throughout the day, from vegan brekkie burritos and rice paper rolls by day, to Balinese curries and jackfruit tacos by night. While they serve fish here, vegans and vegetarians are very well catered to. Aloha! 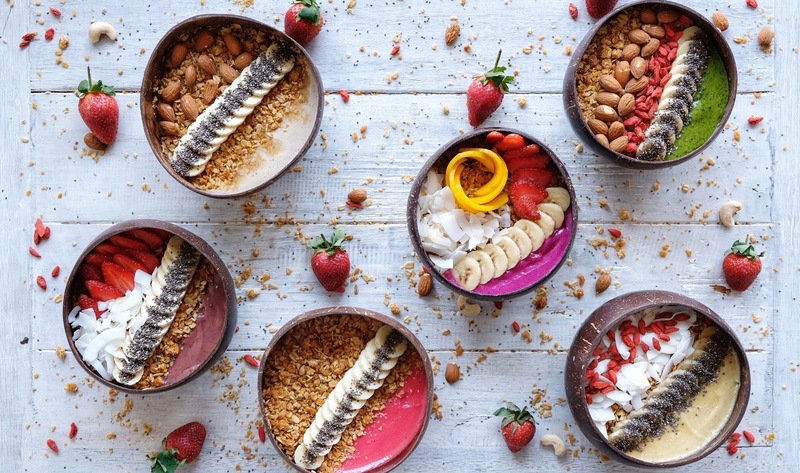 For those who crave a healthy, sweet and refreshing feed all in one (especially pre- or post-surf), look no further then Nalu Bowls – Bali’s original smoothie bowl shack inspired by Hawaii. 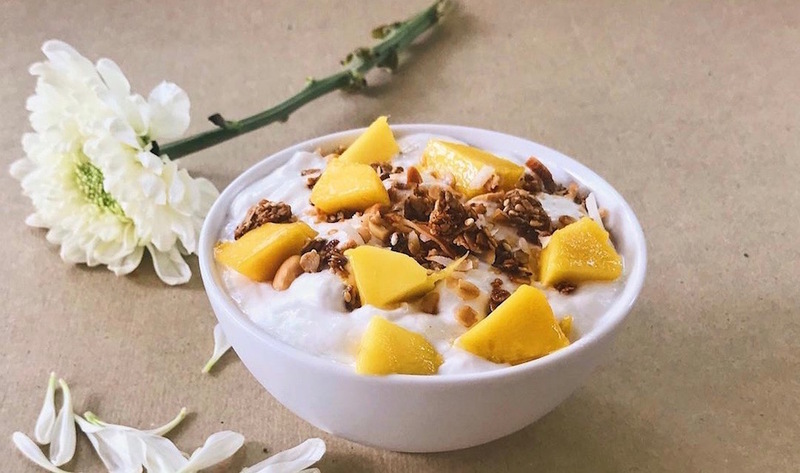 Unsurprisingly, the smoothie bowls here don’t disappoint, with their daily-fresh ingredients made from exotic tropical fruits. Think fresh coconut, mango, banana, papaya and spinach, topped with homemade granola. Keeping it local, their best seller is of course the Uluwatu Bowl, with dragon fruit, raspberries, banana and a hint of apple juice. Made right in front of you, this little gem is a Bali legend, now available in Canggu, Seminyak, Umalas and even Jakarta too! Nalu Bowls, Jl Labuansait No.63, Pecatu, Uluwatu, p. +62 8214575 5461, e. bukit@nalubowls.com. Open daily 7.30am – 6pm. 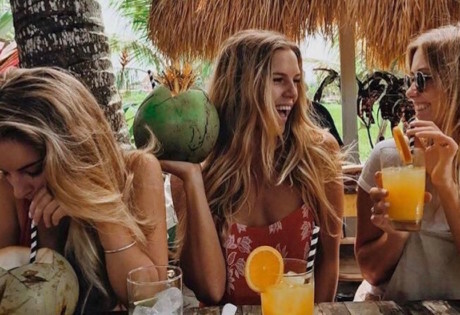 This stylishly simple spot is housed within Uluwatu’s famed Single Fin Bar, serving up delightful bowls of sweet vegan-friendly coconut whip, or Hawaiian style poke bowls with a selection of toppings and salad-y goodies. The only problem is deciding whether to go for sweet or savoury – either way, this is guilt-free snacking at its best! Coco & Poke at Single Fin, Jl Labuan Sait, Uluwatu, p. +62 87 861 640 121. Bali Buda is a flawless example of the slow food movement in Bali – the internationally recognised measure of good, clean and fair food. Local, organic produce fills the menu of this 21-year Bali institution. 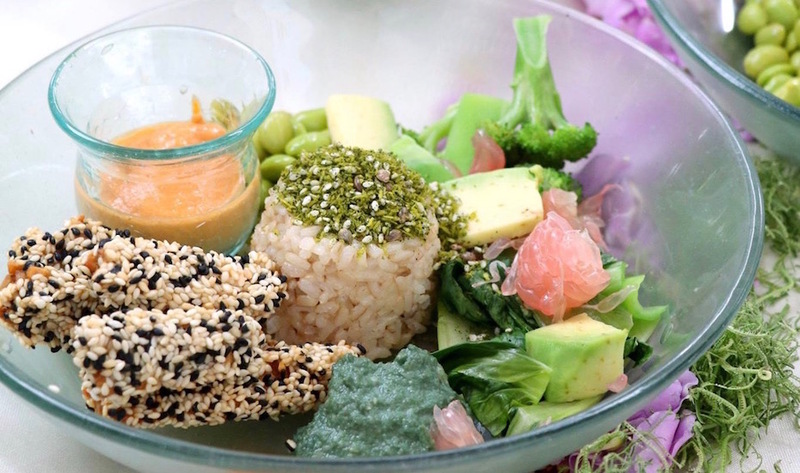 Free from the distractions of Wi-Fi, this homely restaurant and mini-market offers a collection of raw vegan dishes and hot tofu meals made with GMO-free soybeans, and hormone and organic meat-free dishes. This island icon is so popular, it’s also located in Canggu, Kerobokan and Ubud. Bali Buda, Jl Raya Uluwatu, Ungasan, p. +62 361 701980. Open daily 7am – 10pm. 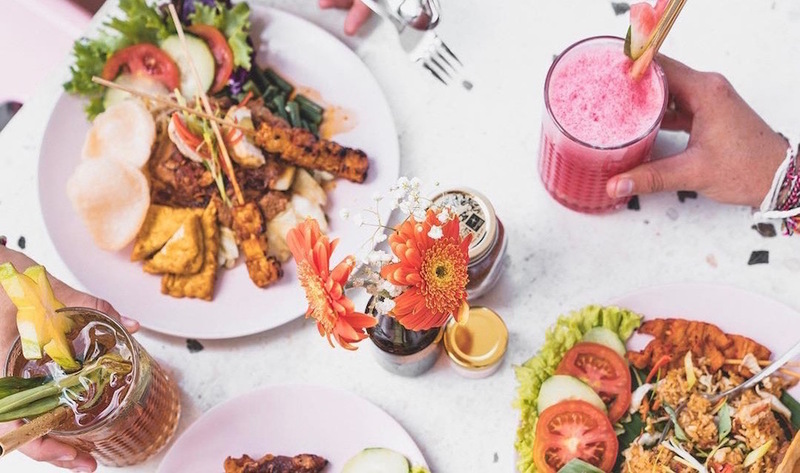 It’s brunch o’clock at Canggu’s best cafes!